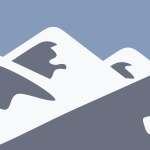 If you find yourself at a trailhead in the proposed Scotchman Peaks Wilderness in the near future, you might notice a new addition to the various signs that are posted at the beginning of the trail. 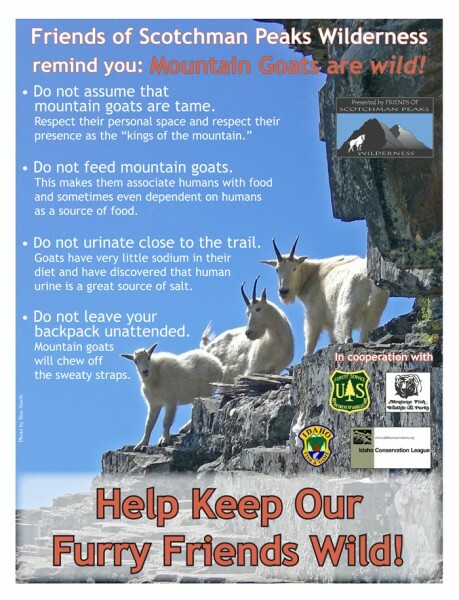 Friends of Scotchman Peaks Wilderness have taken the next step in our goat awareness campaign and have placed a goat poster at each of the major trailheads that access the high country. The posters identify a few practices that hikers should follow when hiking in goat territory. So far FSPW volunteers and staff have posted signs at the trailheads to Goat Peak, Scotchman Peak, Star Peak, Pillick Ridge, Dry Creek, Ross Creek Cedars and Little Spar Lake. Habituated means that an animal is very comfortable around people and tolerates them at a close distance. They no longer behave as if they fear humans. They are, however, still wild animals. Many of the goats are also food conditioned, which means that they are not only willing to be around people, but are actually attracted to places people live, or camp, or travel because they’re hoping for some food. 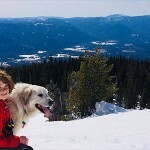 Some will ask why having habituated and food conditioned animals is a bad thing and many people will remember the unfortunate incident that happened last October in the Olympic National Park when a hiker was gored by a mountain goat. The story had a bad ending for both the hiker and the mountain goat, the hiker bled out and the goat was identified and killed. It should be stressed that this was an extremely rare occurrence, it is the only known fatal attack by a mountain goat in the Olympic National Park’s history. But the Friends of Scotchman Peaks Wilderness would like to prevent something like this from happening between the goats and hikers in this region, and other agencies and organizations have endorsed the effort. Idaho Fish and Game, Montana Fish, Wildlife and Parks, the US Forest Service and the Idaho Conservation League all lent their support. Expect to see the posters in other areas of the Cabinets (one is already posted at the Grouse Creek Trailhead in the Pack River drainage), as well as the Selkirks, where ICL hike leaders will be posting them. l was hiking Scotchman Peak yesterday, 29 July 2015. The weather and the views were magnificent. Directions to the trail head should be changed to ‘Road 65′. At any rate, the sign near the summit, “Do not harass mountain goats” is misleading. In fact, the mountain goats harass the hikers by coming up to them and licking their legs for the salt and, l guess, sunscreen. 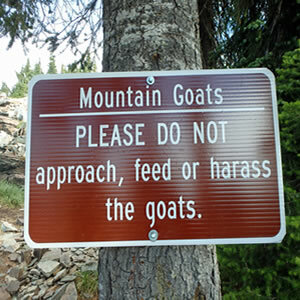 l’d like to see some plan made to discourage goats from approaching hikers. Would a whistle work or some other deterrent do the trick?